Rare. Phenomenal. Surreal. When everything went the way it was supposed to. I have come to believe that at its best, physical activity corresponds to one's life. Sometimes, it hurts. Sometimes, it provides a diversion. And sometimes (and I cannot believe that I am saying this), it provides a feeling of satisfaction and well being. (Those of you who knew me in an earlier stage of my life may now amp your jaws up off the floor!) Let me tell you about my bike ride after supper. The temperature was in the upper sixty's. Remember, today WAS March 31. There was a slight breeze from the southwest--not enough to provide a great deal of resistance--just enough to provide a cooling influence to my overworked, overweight being. I come to the stop sign, and there is no traffic--no unnecessary wait. I head east. First stop light. Turns green as I am a block away. Accelerate. No problem. My mind is processing the day's activities. A slight smile. Next stop sign. Car on the right waves me through. No wait. Bike path. Minimal distractions. Smile broadens. Remove my hands from the handle bars. Flash to "The Titanic". "I am the king of the world." Intersection--mo-ped waves me through. More Titanic. Next intersection--no traffic. Turn toward home. Approach the stoplight. Green! Head toward LATI. No traffic. Up hill with the wind at my back. Not to tempt fate, I head north to avoid the stoplight. Cross street easily because the light is red north/south. Pull into the garage. 6.5 miles of time to think, time to process, time to smile. And that WAS my day. Easy. Fun. Reinvigorating. Tiring, but in a good way. Thanks to the people who made it that way. Let's do it again tomorrow? Rest well knowing you are loved! So, tomorrow, we return to Vietnam Nam...at least via the digital memories we captured. Lake Area Tech's read across the campus deals with the country, and we are to provide a visual tour. Oh, how we enjoyed our return. The warmth of the people. The perspective of our "enemies" and the hope implicit in the children. Our peasant hats, our tailor made shirts, and our old person slants should provide at least a glimpse of the country we learned to enjoy! I know. I know. The song from "Cats" is tripping through your mind..."Mem'ries, all alone in the moonlight..." Well, tomorrow,,we shall share ours. Wish us luck, and know you are loved! noun. That which provides joy and pride. We had the privilege this morning to share breakfast with a former student and her family. The student? Well lets just say it was a few years ago. We've kept in touch due to what I see as a mutual respect syndrome. Teachers NEVER have favorites. She was one of those things I should never do! Imagine my glee to spend time with her, her husband, and their two daughters (unfortunately, their son was already back in college...will save that privilege for later!). What a DELIGHT! The young ladies were enchanting, engaging, and warm. Their relationship was fun--with each other and their mother. Time passed way too quickly, we said our goodbyes, and another memory is added to the album. A good memory. A very good memory. We were never monetarily rewarded for the work we did. We were paid. We managed. But rewarded? Nah! However, there are different kinds of rewards, and this morning was one of them! So...M and H...should you ever get here, thanks for showing me I was right about your mom. She is a person of character, charm, and graciousness...and the apple doesn't fall far from the tree. I loved my job. The love the residuals. And I love you! Have you tried the bread yet? Find your rainbow and know you are loved! Tomorrow night's the night! 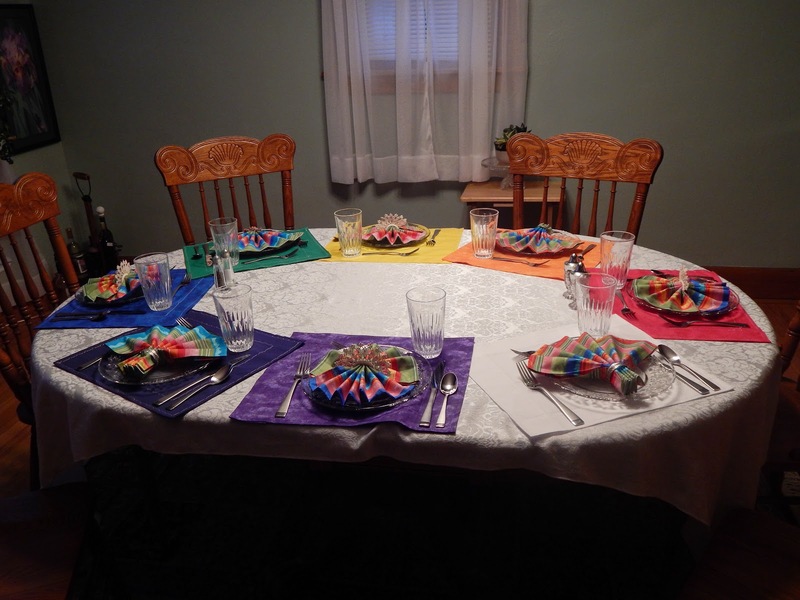 We will be over the rainbow, enjoying food, but much more importantly, enjoying each other. The table is set. Picture to follow. And most importantly, the bread is mixed up and rising. To me, there are few things that can compare with freshly baked bread. And this is the easiest recipe in the world. AND IT WORKS. (And Lee Paulson just turned over in his grave seeing that many "Ands" starting sentences!) If I have posted this recipe before, consider this a reminder to try it. Follow the directions, and I guarantee you will have a delicious loaf of pseudo sour dough just a mere 16 hours later! And as I have said before, food is love! Bon Appetit! Combine the dry ingredients. Add the water and stir until well mixed. Spray a square of waxed paper with vegetable spray and cover the bowl. Place a towel over the paper. Place in a warm place and allow to rise for 12-14 hours! When the first rising time is done, remove from bowl and knead 5-6 times. If dough is too soft, add a little extra flour during the kneading. Let rest while you wash the bowl, dry it, and spray it with vegetable spray. Return the dough to the prepared bowl, cover with the waxed paper and towel, and let rise for 3 more hours. At the end of that period, proceed in the following manner. 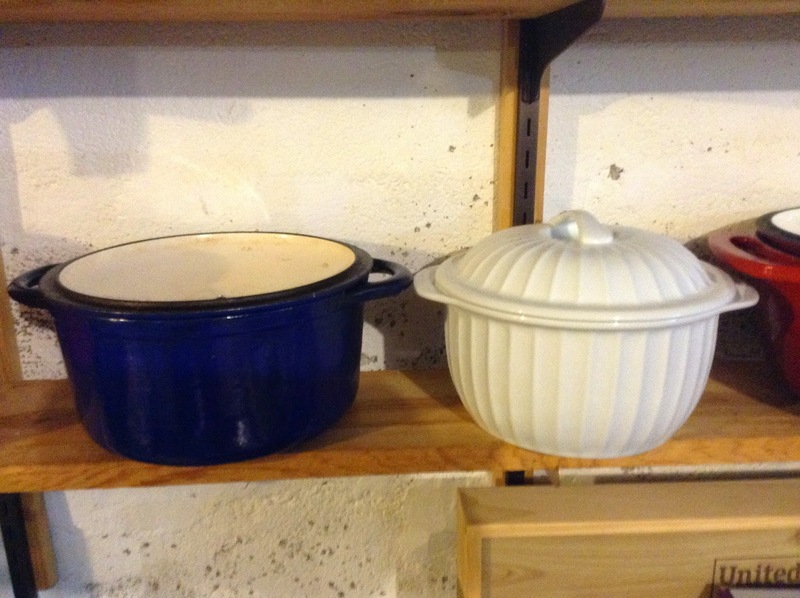 Place the covered casserole in the oven and then preheat to 400 degrees. When oven is ready, carefully remove the casserole. Uncover, spray with vegetable spray and gently roll the dough from the bowl into the casserole. Cover and bake for 30 minutes. Uncover and bake for an additional 30 minutes. When done, immediately turn loaf onto a cooling rack. Wait as long as you can/want before sampling! Notice, I did say I was going to do two. After the first rising, as I knead one loaf, I will knead in about 20 chopped pepperoni and half a cup of shredded Monterey Jack cheese! Once it is well incorporated, I will continue with the second rising. This seems to be a long involved process, but hands-on? Actually less than 20 minutes! And when you've had your first piece toasted for breakfast, you will know why you have done it! Let me know how it works!!!!! I remember a time in my life when that was the norm. The brain cells I destroyed in my youth will probably come back to haunt me. Fact is, I can remember the last time I over-imbibed.' Of course, it had to do with the computer. It was a Pascal course...full three credits...that we took in two weekends. At the end of the second weekend, I came home, filled a 16 oz glass half full of vodka, half full of lime juice, drank it, and then, true to the title, did it again. Even the ensuing regret felt the next morning was better than the class. But I did learn. And I haven't doubled up since. Now, the only use I have for vodka is pie crust, and I'm just too old to sacrifice the few cells I have left, so that's where it shall stay. Today, my double is the love I have for you! If you were with me yesterday, you know that we are eliminating old wall paper. To facilitate the process, I recalled an article that said fabric softener worked. It does. But I fear we may have overdone it. The fumes linger. Okay, they malinger. I can't even sit in the room to watch tv! Windows open, fan on, and fingers crossed, tomorrow will smell better! Live and learn. Olfacotorially and lovingly yours, bz. I spent the afternoon stripping. Taking off one layer, and then another. At no time did my adoring public offer to place dollar bills in the waist band of my brilliantly colored shorts. At no time did cries of "Take it off! ", ring through the room. I was perplexed. Was it possible that the body beautiful didn't meet the prurient interests of my observer? I suppose in the spirit of honesty, I should tell you that my observer has been the same one to witness me stripping for over 41 years. But still... In an effort to liven up the process, I even resorted to spray sensuously scented oil based derivatives over my body of work. And yet no cat calls. No whistles. Oh, there was an occasional "are you done yet? ", but thankfully it wasn't said derisively. And the answer was no. It is early spring, after all. The layers come off slowly. And tomorrow is another day. Perhaps by its end, the walls will be ready for their new paper. And you will still be loved! It is my belief that we are the sum of our choices. Joy can be multiplied when a choice is well made. Love is the only thing that increases when divided. Friends subtract pain and sorrow. When two people share a life of joy and love...when two people are best of friends...rewards increase geometrically. 42 years ago today, Miss Cathryn and I each made a choice. I asked. She accepted. And the product of those choices for me? A quotient of happiness that continues to amaze and delight me. And in my life, she is the difference. It's simple math! Being an lifelong upper midwesterner, I look for things to celebrate. A day without wind. A driver not on the phone. A good bridge hand. I'm not difficult to please. Any little thing will do. As I write this, I am within 34 hits of 40000 viewers. That makes me smile. That floats my boat. That tickles my fancy. That winds my clock. In short...thank you! Hopefully you've had a smile. Hopefully you've found a recipe. Hopefully you have better things to do, but I truly appreciate you taking the time to stop here. Frequent readers know this. First time reader? Come on back! Because you all are loved! So...the hors d'oeuvres were low carb. Cheese crisps and chicken zucchini sliders with a yogurt avocado dip. The salad was low carb...no croutons...low carb dressing. The entree was low carb--chicken, bacon, and broccoli in a cheesy chicken broth. Virtuous. I'm feeling virtuous. Of course, I shall not mention the three pieces of fresh pepperoni and cheese bread I had. I shall not mention the two glasses of medicinal wine. And I definitely won't mention the blueberry pie you read about yesterday. Virtuous went right out the window. I guess fluffy won over gaunt! But I'm smiling, I'm happy, and you are loved! Take three of my favorite flavors...sour cream...almond...blueberry. Place them in a pie dough. Crumble goodies over the top, and the three become one amazing pie! Enjoy the baking trinity, and know you are loved! For the crust...combine first six ingredients in food processor. Pulse until evenly blended. Pour into a large glass bowl. Add vodka and stir until dough sticks together. Form into a ball and roll out on a floured surface. Transfer dough to pie plate, trim as needed, and folding crust under top edge, crimp. Set in freezer while preparing the filling. For the filling...Combine first 6 ingredients. Gently add blueberries (if using frozen, I would thaw them first) and stir until well mixed. Remove pie dough from freezer. Pour filling into dough and place in preheated oven for 25 minutes. Pie will be partially set. While baking, prepare the crumble. For the topping... Combine flour and sugar. Cut in butter until mixture resembles coarse meal. Add pecans. After 25 minutes, remove pie from oven. Sprinkle crumb topping over pie and return to oven for 12 minutes. Remove and allow to cool on a wire rack. I'm watching the evening news, my 12 oz grilled and barbecued pork chop resting beside a stack of fresh, buttered asparagus. Heaven is just around the corner. And then, I actually watch the news. Over 150 killed in a mosque--worship interrupted by a suicide bomber. A little closer to home, a mob of hooligans attack a car and driver. Okay, a lot closer to home. Sioux Falls! Story after story of the stupidity and hatred of my fellow species. I DON'T GET IT! At 65, I just don't get it. How on earth are any of these things possible? As much as I hated the 325,323 hours of history I had to take in college, I know none of this is new. We have been up to the destruction of our fellow man apparently since that bite of an apple so long ago. But we're smarter now. We can Google. We can find solutions to our problems. Solutions that don't require death and mayhem. And yet, we perpetuate the past. We claim our one true god. We claim our one true government. We claim our one true belief structure. And damn those who don't agree. Literally damn them. And here's the irony. As I understand the major religions of the world, the directive is to add good to the world. Maybe it's all about math. We don't ADD good by SUBTRACTING that with which we don't agree. We don't reach our holiest of holies by violence or bloodshed. We reach it with a will to accept difference. We reach it with a desire to add value. We reach it one person at a time. Make a friend. Do good. I'm pretty sure the answer is not quit watching the news. But darn, it did ruin the digestion. From now on, supper is served before the news...if I can just avoid Dr. Phil! Make it different! Make a difference. And know you are loved! just sitting under the bottom step. Waiting. To inspire. If you're still with me, and haven't run to the phone to call the little white men in their little white sheets to come and take me away (ha ha, ho, ho, hee, hee! ), let me explain. When I speak (and god knows I do a lot of that! ), I often talk about prioritizing. And I tell the story of the science teacher explaining "the concept". He takes a glass beaker and fills it with large stones. When he can place no more in the beaker, he holds it up and asks the class if it is full. Of course, the answer is yes. He then takes some small pea gravel and pours it in over the top of the large stones. It settles in the crevices, and he holds it up and asks if it is full. Being the bright class they were, some said yes and some said no. He then took some fine sand and poured it over the stones and gravel. It apparently filled the beaker. Again, he holds it up and asks the question. This time, there are few yes's to "is it full?". Finally, he takes a glass of water and pours it into the beaker. Once it can hold no more, he carefully holds it up. "Is it full?" Of course, the class is sure the answer is no, but at this time, the teacher says yes, it is...for nothing more will fit without spilling some content. Then, of course, there is his question. "What does this teach you?" Remember, I said the class was bright. Hands shoot up. "There's always room for more." "Don't jump to conclusions." "Can I go to the bathroom?" Okay, so they weren't all Rhodes scholars. Each question is answered with a simple no, and finally, there is the last question: "Okay. We give up. What does it teach us?" The instructor, with a smile that comes from years in the classroom, says simply, "You have to start with your big rocks." Such is life. We need to identify those things that are MOST important in our lives and BEGIN with them. When, and only when, we're sure they fit into our lives should we find the smaller items. Face it. If you were to put in the water first, there's no room for the rest. And all of this because of a stupid rock! 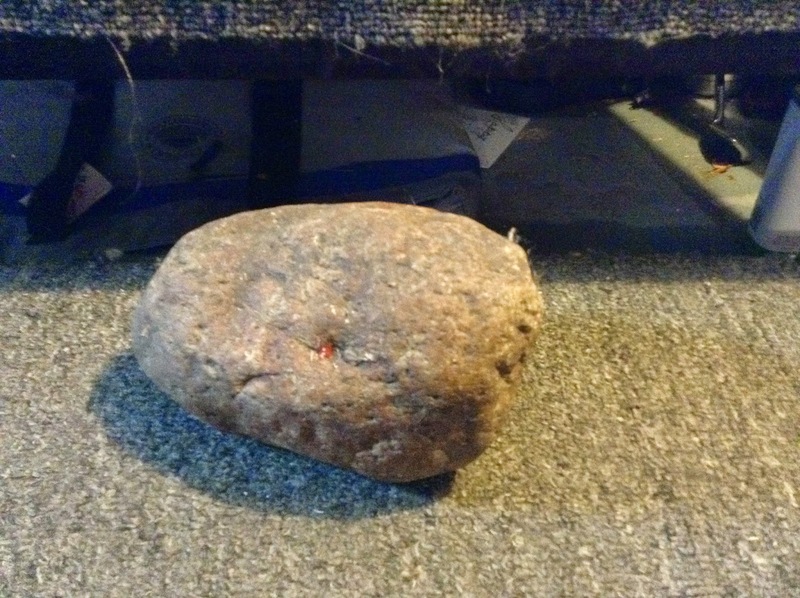 A big rock! and you, my readers? There's always room in my beaker for you. Know you are loved! You know I love Facebook. I am as enamored with Blogspot. What an amazing way to stay in contact with phenomenal people. Like you. That being said, I just did something I don't do enough but think I should. So should you. I just hand wrote a thank you note for supper last night! It was a truly delightful experience, and somehow, an e-mail or message just didn't seem appropriate. If you are a fastidious reader, you will recall my rant about lack of penmanship and cursive teaching. The very fact that someone would take the time and effort to sit down and WRITE a note says a great deal. So, as I am wont to do, here is your challenge. Before a week goes by, jot someone a note. It' doesn't have to be GONE WITH THE WIND! It could be a little stick-em note. It could be on the bottom of a card. It could even be on nice stationery. But make it more than just signing your name. Let the person know they are special. And once you discover the impact that will have, do it again! You'll feel good. They'll feel better. Make it personal, and know you are loved! Super last night at the neighbor's. Amazing food. Better company. Supper tonight at another friends. Amazing food. Better company. My waist line can't stand too much more of this. New recipes and new jokes. The best of all worlds. If you've ever been to one of my cooking classes, you know my philosophy--laughter aids digestion. Well, I should digest well. The way to this man's heart is definitely through his stomach...and his funny bone. And I heart you...every night in a row! It was a road trip day. We needed to go to Sioux Falls, and whilst there, we decided we should do a little shopping. For furniture! The recliner in the man cave has seen better days, so we were on a mission from god to replace it. Checked everywhere here in town first. Couldn't find the right fit. You know it when you sit on it! Went to Ethan Allen and worked a while with Christine. Found a chair that might do. Found swatches of material that were impressive. Found leg color. Decided to decide later, so off to look at other stores. Walked in to Conlin's. Should have known it was meant to be as Kathy (okay, she doesn't spell her name correctly but...) showed us the red leather number. Sit. Recline. Look at others. Go back. Sit. Recline. Discuss. Look at fabrics. Go back. Sit. Recline. Decide. Load the sucker in the back of the van and head for Sam's to pick up coffee. Yeah, I know. I can buy coffee in town at all the places that carry coffee. But NOT for this price. Picked up a few other incidentals and headed home. Unpacked the groceries. Went into the man cave. Moved the old chair. Sat it down. Cussed. Cath helped move the old chair. Cussed again. The door with the inset mirror had to come off. The 3233 pound door with the inset mirror. Get the tools. Remove the hinges. Take the door to the kitchen. Maneuvered the chair out the door, up the steps and into the bedroom where it shall reside until we do something else! Go to the van. Get the new chair. Bring it in the front door. Deliver it to its new location. Replace the friggen door. At this point in time, you might recall we are of an age that perhaps shouldn't be moving furniture...unless you are as young and fit as the zubke's! Tomorrow we may suffer! Tonight, I shall be sitting pretty! And you shall be loved! 1) Where did those muscles come from? 2) On a clear day, everyone comes out to play. 3) No back bumper = an interesting mud splatter pattern. 4) Where did those muscles come from? 5) The wind always blows in direct proportion to how tired I am. 6) Runners take exception when you pass them saying "it's easier with wheels". 8) There is a turn signal at one intersection and the oncoming cars do not take kindly to my ignoring it. 9) Yoga has improved my balance. I didn't fall over once. 10) Gurney. I see a gurney in my future. And a crane. To get me out of bed onto the gurney. And a lot of "ouch" and "oooh" and feeling sorry for myself. And then I realize, it is March 15! March 15! And I rode in shirt sleeves and shorts. In South Dakota. And 1 - 10 are replaced with a feeling of awe and thankfulness...and who cares if it hurts? It was good! And you are loved! It was one of those days. Gorgeous temperature. Great times with friends. Good food. A little intellectual stimulation. A little political discussion (notice I treat these two as separate items!). And I got the Christmas trees put in their place! All in all, a good day. Like most!!!!! At least, that's my story and I'm sticking to it. I am indeed a very lucky man. My parents taught me to look for the good. My friends provide me with fodder. And my wife is the good! But now, it's time to fall asleep in front of the tv and dream of the fun that awaits. Thanks for being here, and know you are loved! The tale of the recipe tape to this point in time: Chocolate Chip Cookies--38. Pecan Crusted Chicken--37. For me, a metaphor for life. You truthfully need both aspects to enjoy the complete meal! And, if possible, they should be close to evenly distributed. Too much sweet, and we lose an edge. Complacency sets in, and we pop the button, expand the gut, and watch television. Teeth rot. Minds rot. Of course, the flip side is also true. Too much savory and we become dulled to the good things in life. We enter pity city and move in. Poor me literally becomes poor me. But a blend? A good thing! We need something to motivate and something to reward. And so it is written. And so it shall be. (I've always wanted to experience my Pharaoh alter-ego!) Enjoy the full deal meal, and know you are loved! The old Pillsbury slogan is right on. Homebuilt vs purchased? Never a contest. You see, home built comes complete with the love that went in to the product. Granted, at any given time, an Oreo can say a lot. But oh, those chocolate chip cookies...especially warm! You probably have your own special recipe, but just in case, here's the one that produced the 8 doz. cookies cooling on the counter. Enjoy and know you are loved! scoop, place cookies on ungreased cookie sheet. (Or discover the true bliss of parchment paper!) Bake at 375 degrees for 7-9 minutes or until lightly browned on top. One of the things about retirement? The time. In this case, it would be the time available to do the things that need to be done. It is an extreme benefit. Instead of fitting things in as they might fit, one can take the time to do things in a timely manner. Of course, that makes the assumption that one is extremely organized and willing to give up his time. One of us isn't. That means, while procrastination does indeed begin with pro, and I am the world's best pro at crastinating, sometimes one is left with a list that needs doing in one day. Today was such a day. And, since I have time to write, you might assume that I did indeed finish my list. Foolish assumption. I simply moved some items from today's list to tomorrow. Smart, huh? Of course, that does mean that tomorrow looks a little bleak, but as William S. would say, "Tomorrow and tomorrow and tomorrow creeps in this petty pace from day to day..." Of course, later on in the soliloquy he hits the nail on the head! "It is a tale told by an idiot." That would be I. But I will be a rested one when tomorrow arrives. Lists? I scoff. And will regret my actions tomorrow. Until then, however, life is good and you are loved! DONE!!! And you are loved! I have for you a visual. It's 53 degrees outside. Let me repeat that. 53. I am currently clad in a pair of bright orange shorts, an orange shirt that matches, and I just took off my orange hoodie. Any comments about a giant pumpkin are most probably in order. But rules are rules. At this rate, I will have to take the Christmas trees down in the back yard tomorrow! And all of these comments are surpassed by the smile on my face. It can't be long, now! And you are loved! I admit it. Freely. With abandon. I've got it. Bad. The pillowy cumulus clouds. The running rivulets. The lack of layers upon layers. The brilliant blue. The effortless smiles on the people I meet. Yup. I definitely have it. And I embrace it. Wipe the smile off my face if you can, it shall return. For I not only have it, I revel in it. The capriciousness that is South Dakota may take it away in a minute. But up until then, it will carry me through on a fevered pitch! Winter will end, and spring will win. I can just feel it! And you are loved! When it comes to protein, I love chicken. I can even trace the transcendence of the protein. I was taught at an early age when I was being treated to a meal in a restaurant, it was a wise thing to order something on the lesser expensive (cheap) side. That was always chicken. Likewise, when Ms. Loosewheel would make fried chicken, it was top of the line. Now, if she got a little bit bucky and tried something different, like putting caraway seeds on it and baking it, well that's a different story. But chicken is my go-to meal. Needless to say, when I find a new recipe that works, I am excited to share it. Such is the case tonight. We just finished a meal of pecan crusted chicken breasts with a side of garlic fried red cabbage and a vinegar cucumber salad. I'm pretty sure you won't want to be in the same room with me tomorrow, but right now, I'm wallowing in the afterglow! What's that you say? Will I share the recipe? Of course I will...because you ARE loved! It's not often when I can guarantee neither Zubke is full of excrement, but due to a bi-fecta in scheduling, we have both been declared good for another five years! I be smiling. Seems as how as the years mount up, the concerns over depreciation of original equipment become niggling. However, like a fine machine, a tweak here, a prod there, and we're good to go. We're a little less shiny. We're a little less new-smelling (especially considering what we've been through! ), but we're a lot more comfortable and still a reliable mode of communication, friendship, and love. I've said it before, but I need to give a shout out to the mechanics that do their magic to keep us that way. The doctors, dentists, nurses, and health care professionals enjoy in this house a reputation of care, concern, and utmost trust. So today, we'll not kick the tires. We'll not flush the system (again). We'll give thanks for the extended warranty, and we'll keep on truckin'! Know you are loved! Not yet 6:30 in the am and I find my body movin' and groovin' to "Johnny B. Goode". Not necessarily the prettiest sight, but who cares? Those cars driving by are entitled to an early morning giggle, right? Excitement reigns supreme today. There is light on the horizon, the liars tell me we are in for a warm up, and -8.3 on the digital thermometer won't appear again for some time! And now it's "Angel Baby", and the swaying has begun! Bless the oldies (for I am one!). They still manage to inspire, and remember you are loved! I contemplated an end to this blog. At times, topics, as those of you who read it can attest, are sketchy. If I were to look back, I'm sure some are extremely redundant, and that's not a good computer redundancy, either. It has, however, become habitual, and a friend to whom I can turn to vent, to laugh, at times to cry. I always, as you know, have dreamed to being a writer. And since my forte does not seem to be length, it provides an outlet for that dream. So to those of you habituated by my siren call, rest easy. Contemplation in this case will not lead to action--at least for the time being! And who knows--I may one day collect the wisdom proffered in this arena and publish a collection. And tomorrow, the sun shall rise in the west! The two things with which I will leave you are these. 1) See you tomorrow! 2) You are loved! There are very few things that I do not care to discuss. In fact, I can't think of one. The key word in this sentence is discuss. I do not need a lecture on why the president is good. I do not need a lecture on why the president is bad. In fact, I don't need a lecture. From as far back as I can remember, lectures have NEVER been high on my list. And yet, I Facebook. Hmmmmmm. There apparently are no moderation and tolerance filters to be found on Facebook. I have my opinions. At times, they change when I learn new things. Hopefully, the same is true with you. Ranting, raving, belittling, demeaning, and partisanly degrading a person or ideal provides no new thing to change my mind. Just sayin'. Let's make a pact. Unless we're face to face, or one on one, let's not dis, and let's not cuss. Let's wait until we can concatenate the two. Of course, not open for discussion is the fact that you, my readers, are loved! 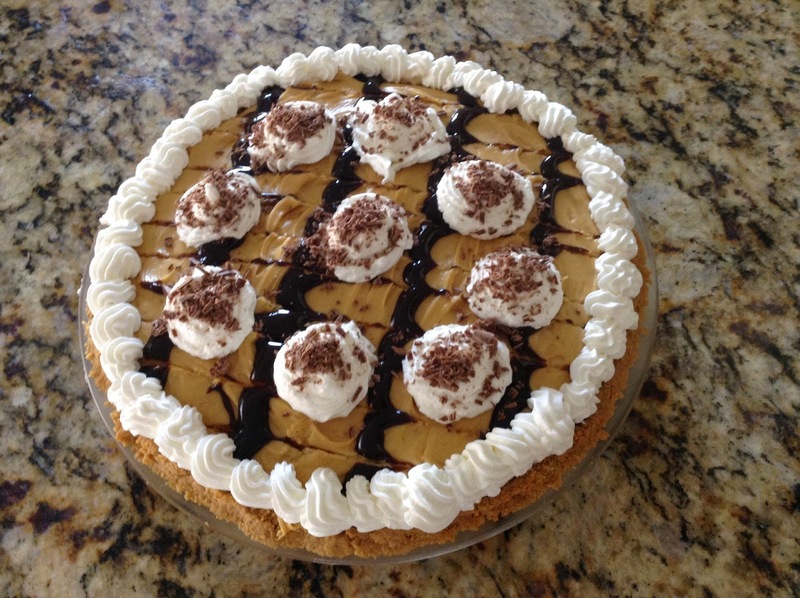 That would be the peanut butter pie I mentioned earlier. If the whole is greater than the parts, it's going to knock someone's socks off. Each part has been tasted separately, and we wait until tomorrow for the combination effect. It's a bit time consumptive. It's a bit equipment hoggish. But it's peanut butter and chocolate! How can it be bad? I hate to string you along, but you'll have to wait until tomorrow for the evaluative results! Until then, if you can't stand the wait, check out the link below to take you to the recipe, and always, always, always remember you are loved! March--the month in which spring hopes to arrive. And hopes spring eternal. (Clever transposition, don't you think?) Actually, it is a quiet Sunday morning. We have done the puzzle. We have played a little bridge. We have fortified our bodies with low-carb comestibles, and we are about to sojourn out into the weather to exercise (or exorcise) the bodies beautiful. No deep thoughts. No earth-shaking events. Just the realization of how lucky we are to have each other and be able to do as we please. We'll put a spring in our step and live with the hopes that you know you are loved!